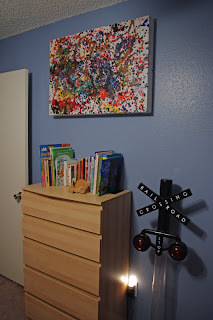 Last week you got to see a glimpse of the fun the kids and I had trying our hand at Painting a Pollock. Today I am going to show you how we hung it up. On a total side note, last week week we took a visit to the Houston Museum of Fine Arts and got to see a Pollock up close and personal! Just wish I could have taken a photo of it, but I didn't want to get kicked out of the museum. 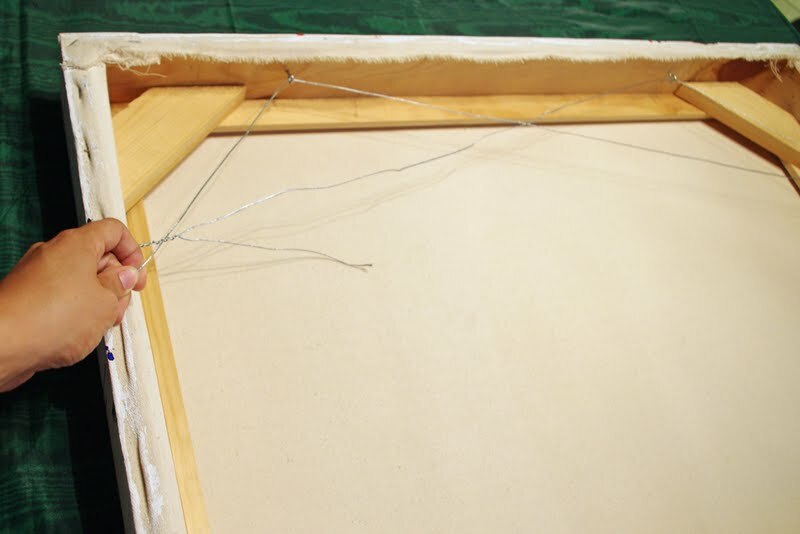 In order to hang a canvas, there are a few items you will need. 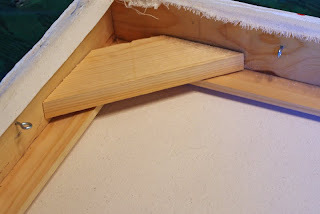 Most of which you can find around your house and the rest you can buy individually or get in a picture framing kit. Determine which side of your canvas is going to be up (because on a Pollack, it could be any way). Make sure to mark the back with which side is up. Then from each corner, measure about 1/4 of the length and mark it with your pencil. 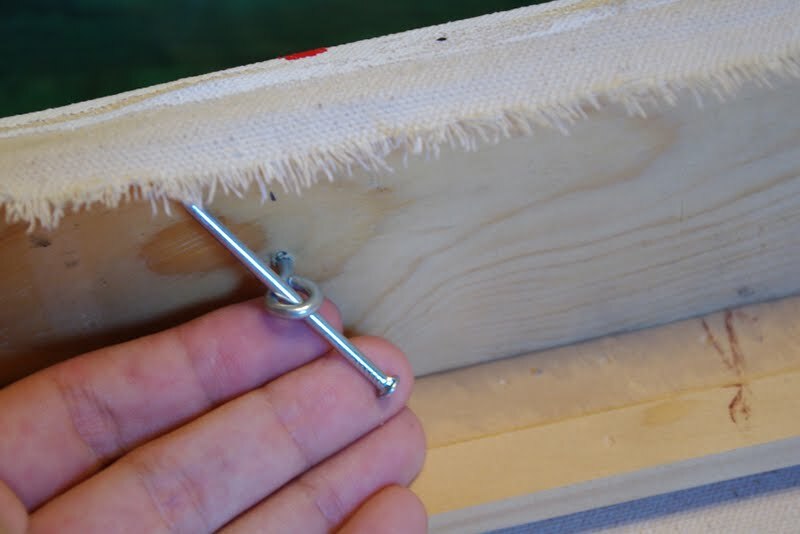 Take an eye screw and tap it into the wood with your hammer. Once the eye screw is started, you can turn it by hand. If it's a little difficult to turn towards the end, take a screw and use it as leverage to turn your eye screw. You should have 4 eye screws in place. Each upper corner of your canvas should look like this. Next, you will need your picture wire. You will need it to be 2 1/2 times the length of your canvas. 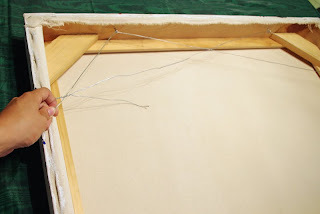 Start on either of the sides and loop your picture wire and then tie it off by winding it tightly around itself. You will string it from the left side, to the top right, then to the right side, to the left top, then back to the left side. It will make a big "X" in the center from where it crosses. You will also have two triangles, one on either side. 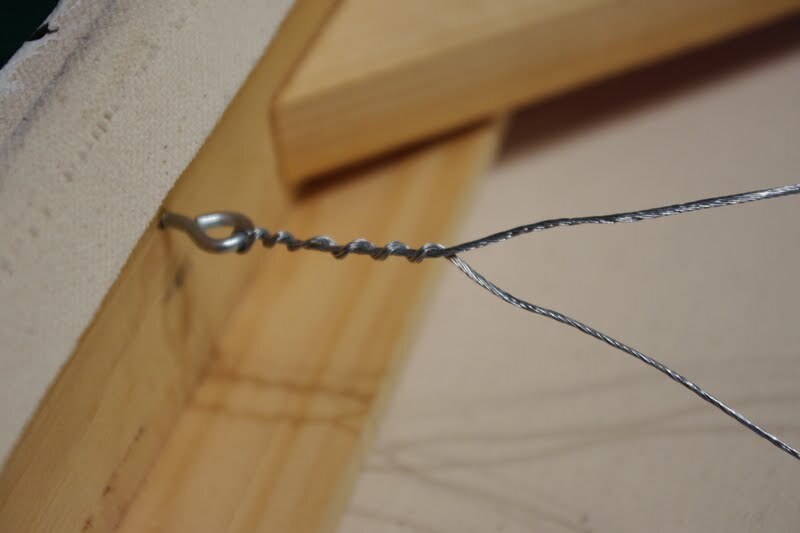 Pull tightly (but not super tight) and tie off the end of the wire like you did the first time. 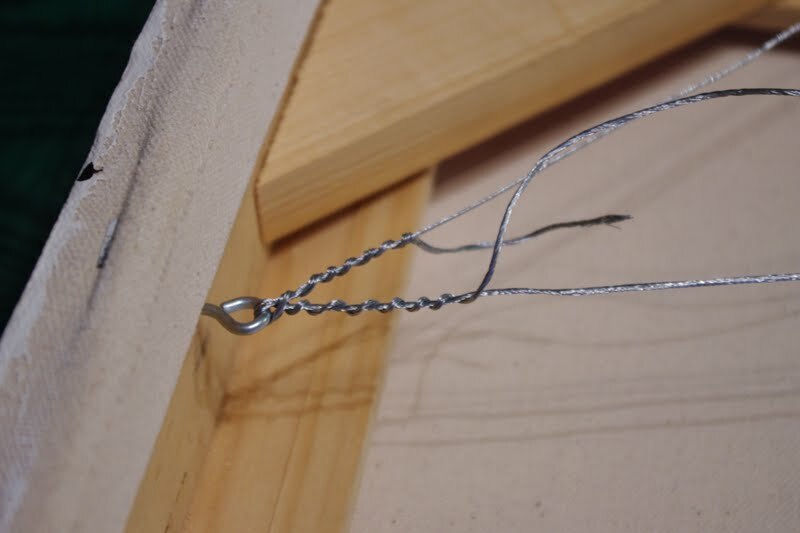 Cut off the excess with either your scissors or wire cutters. Your canvas is done and now comes the easy part. Grab your hammer and picture hook and nail it into the wall where you want your painting hung up. 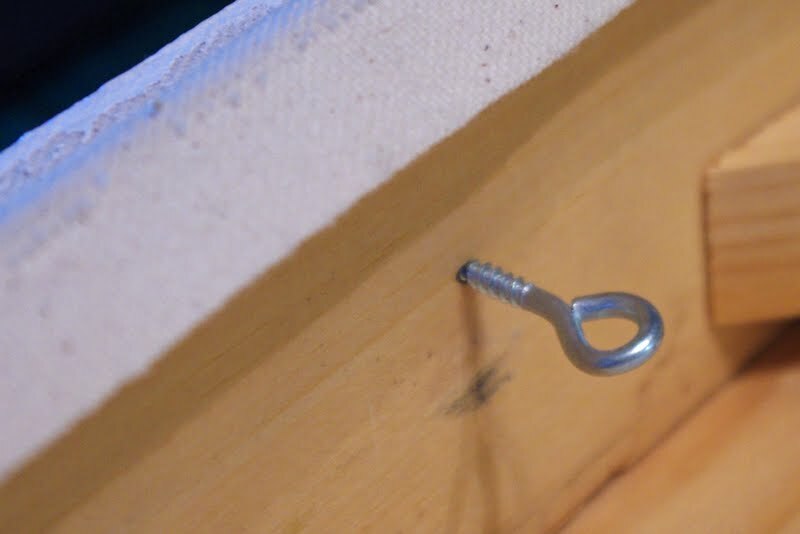 Then hang your canvas on the picture hook where the "X" is on the back of your canvas. The reason for the "X" is to make it easier for your painting to hang level. It's a fairly simple process and doesn't take long at all to do.